Today we’re announcing a new set of features in Google Shopper for Android to make it even easier to research products and find great value deals when you’re on-the-go. First, we’ve moved features around a bit to help you perform common tasks more quickly. For example, the ‘Starred’ and ‘History’ buttons are now at the top of the page. We’ve also added new tabs to the bottom of the screen for fast navigation to Google Shopper’s newest features. Today’s Offer: part of the Google Offers beta program, this tab displays a single offer for discounted goods or services in your area. Today's Offer is currently available in Portland, Oregon, the San Francisco Bay Area and New York, with other cities to follow. 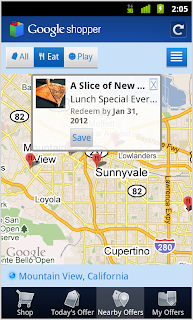 Nearby Offers: when you click this tab, you'll see offers in the 'Eat' and 'Play' categories which nearby businesses have submitted through Google Places. My Offers: for those of us who occasionally misplace coupons or gloss over expiration dates, Google Shopper makes it easy to stay organized. When you come across an offer you like you can save it for later. 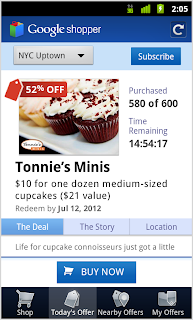 Your saved and purchased offers appear on this tab and you can see which offers are close to expiring. 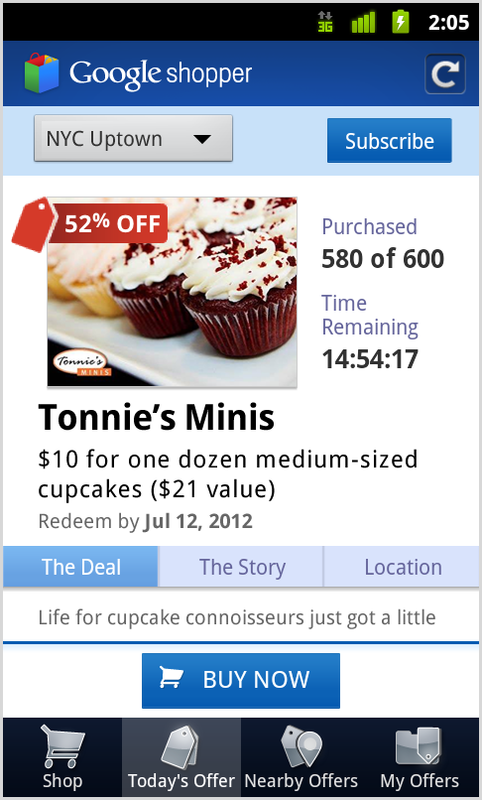 To take advantage of an offer, just navigate to ‘My Offers,’ select the one you’d like, and click ‘Redeem’. 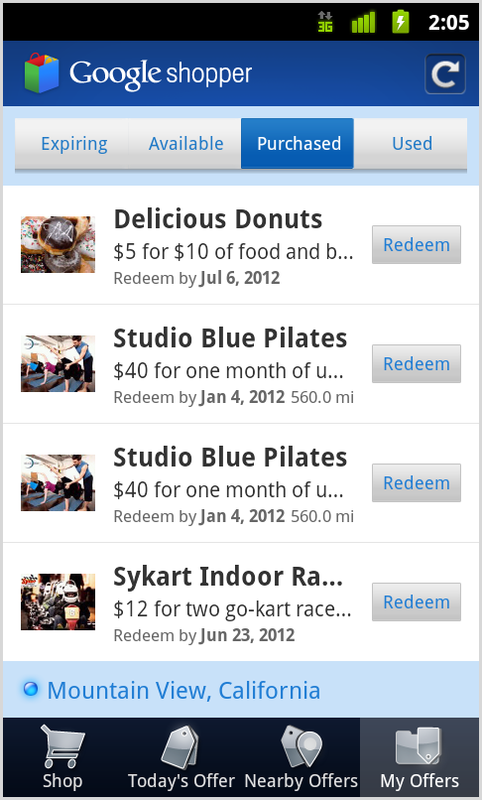 In the future you’ll also be able to access and redeem your saved offers using Google Wallet. 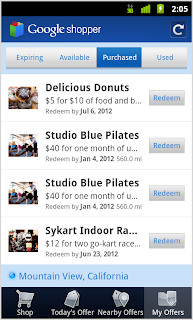 Tap on Today’s Offer, Nearby Offers or My Offers to see great deals. Visit Android Market to download Google Shopper 2.0, currently available for Android 2.1 and higher devices in the US and UK. If you already have the app installed you’ll automatically receive a notification to update it. Version available from the market shows 1.5.1, not 2.0. Please consider rolling this out to Canada as well? I can't see it being that hard, and we've been so good to you thus far...? i'd appreciate being able to access my 'history' on the web. What's with all the space-hogging Google apps? Plus is 7.8MB (with no apps2sd), Shopper is 3.3MB *after* moving to SD, Maps is over 12 MB, Music is 9MB, Books is 4.3MB, Goggles is 4.2MB, Google Voice is 2.7MB. The new tweaks to Google Shopper are welcome. Now let's add Google Wallet into the mix. Agree with Paul W. I personally have the n1 and really need to watch my space. This has really helped me with my current app. I was looking for something equivalent this, and finally got it here in your blog. This is really fascinating, and I am sure I will check it back soon. Just be sure you update it with original concepts.